Norway. The place where my maternal Grandmother’s family originated. I wish I knew more about them, but experiencing the country was part of the reason that we were in Scandinavia. Of the four Scandinavian countries, Norway is the one with the most amazing heights. Within the fjords, mountains jut above the landscape like jagged behemoths. The fog, forests and rivers put one in mind of wood nymphs, sirens, trolls and hobbits straight out of The Lord of the Rings. We were fortunate to be a part of a small Firebird Tour group for part of our vacation. It was well worth experiencing. All of our transportations (cars, trains, planes and boats) were taken care of. Our hotel accommodations were excellent. 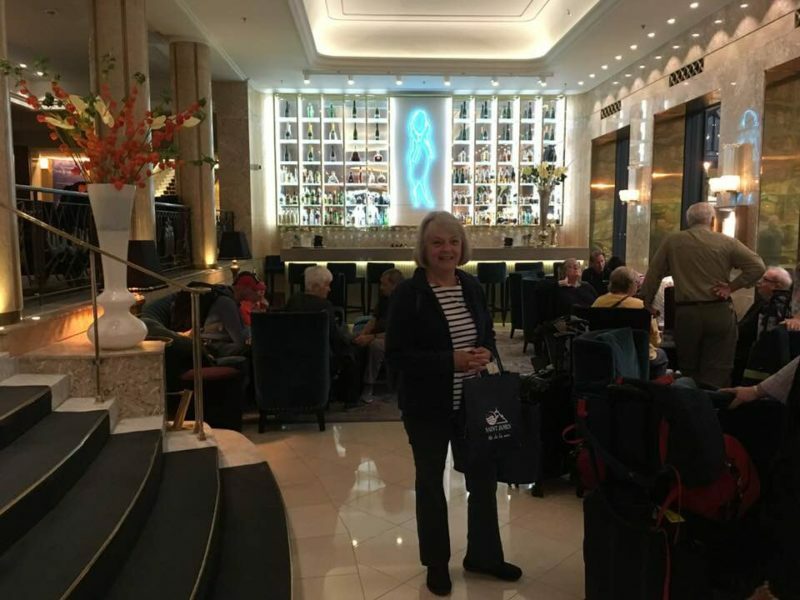 We stayed at the Grand Hotel in Oslo, Norway. 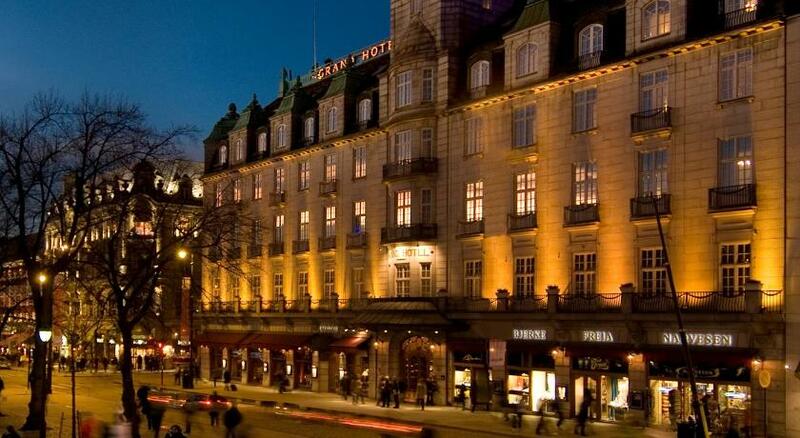 All of the Nobel Prize recipients stay here before the awards ceremony. Next to the hotel is the Freia shop selling delicious Norwegian chocolates. We all met in the lobby after our two days there to take a train to the fjords region and Bergen, Norway. 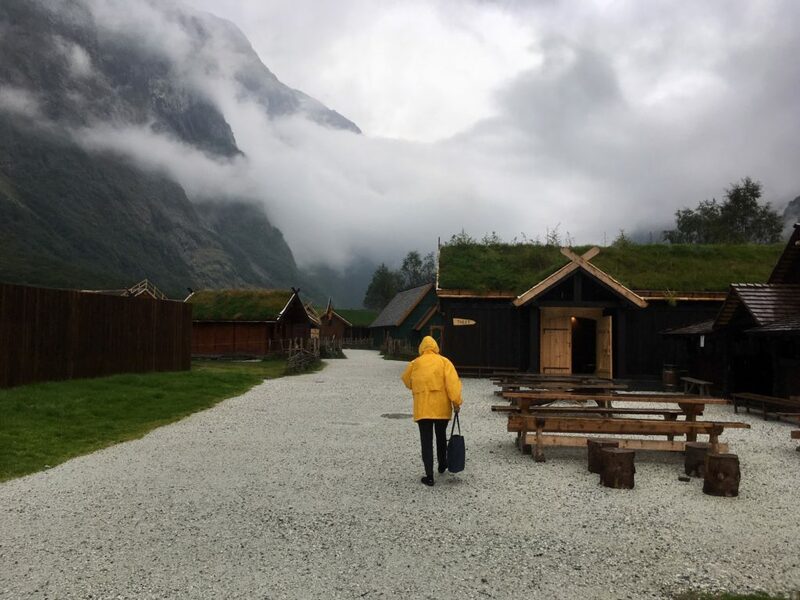 Since prehistoric times, Norwegians had covered their homes with sod roofs. The sod covered layers of birch bark and acted as insulation, as well as being able to absorb rain water. The vegetation growing on the roofs was also attractive to goats. I can picture a humble hobbit warm and snug in his home with a goat chomping away on his roof. 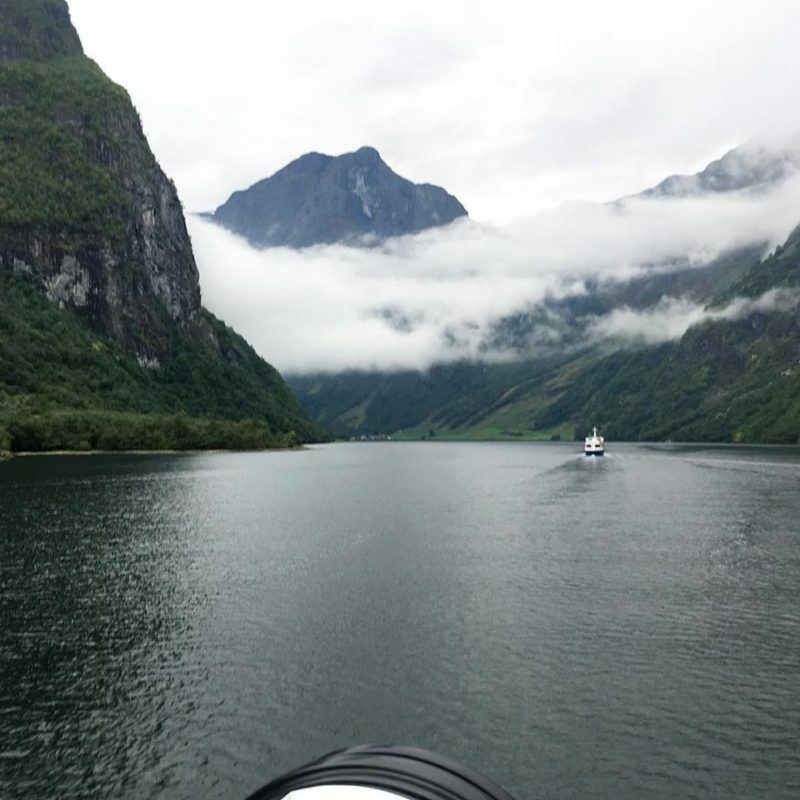 For a region with countless fjords and waterfalls, Norway is known for its pristine water. Even the tap water is crisp and clean. Norway exports a very expensive bottled water called Voss that is popular with many Hollywood celebrities. Apples have been a crop in Norway and the other Scandinavian countries for thousands of years. They have been discovered on Viking ships which had been buried in clay. The clay preserved the ships and allowed us to learn much about the Viking way of life. Apples are harvested in the Fall as they are in our country. This a version of a popular, simple apple cake with Norwegian roots. Grease and flour a 9-inch tart pan (with removeable bottom) and set aside. In a small bowl combine the flour and baking powder and set aside. In the bowl of a stand mixer with a whisk, cream the melted butter and sugar until light and fluffy and the sugar has dissolved. Add the eggs one at a time, mixing thoroughly after each egg. Add half the flour mixture and all of the milk. Mix thoroughly and then add the remaining flour. Combine until no streaks of flour remain. Spread batter in the prepared cake pan. Core and cut the apple in half. Cut each half in to ⅛” slices and arrange on top of the cake batter in a decorative pattern. Sprinkle with a mixture of cinnamon and turbinado sugar. Bake for about 35 minutes or until golden brown and cake is thoroughly cooked by testing with a toothpick. What a beautiful magical looking country! The apple cake looks beautiful and I bet it taste amazing! Thanks Penny. Enjoyed our outing this week. Beautiful pics and the tour sound amazing. How many were in your group? We had only 15. Everyone was great. A couple from Australia, 2 couples from Canada, sisters from Hawaii and Oregon etc. It’s fun discovering different landscapes..The hotel looks beautiful..and so does the cake. Thanks Monique. Makes me want to keep traveling. Gonna try this cake tomorrow for dinner; looks ‘oh so good’. Thanks for this lovely post. I hope it works for you Carol. Let me know what you think. Thanks Madonna. It is simple and adaptable. Glad to see you posting again; I have missed your posts. Would love to go to Norway one day as it is my heritage, too. So happy you escaped the hurricane. After Harvey last August, it has heightened everyone’s awareness. The Lord watched over me with only water surrounding the house, but no interior damage. Thankful! Biny, So happy to hear from you. I hope you get a chance to experience Norway. It is a very happy country with beautiful scenery. I hate all of the hurricanes that we have been subjected to. So far, we have been lucky because we are on high ground. Sounds like you are too. Stay safe and keep in touch. Thanks for your comment. Apple cakes are so simple but filled with so much flavor. It looks almost too pretty to cut into. Thanks Karen. Enjoying your trip! What a beautiful place! I think I do see a hobbit 🙂 We have good friends who were in Norway, Sweden and Denmark in September also. Would love to visit one day. 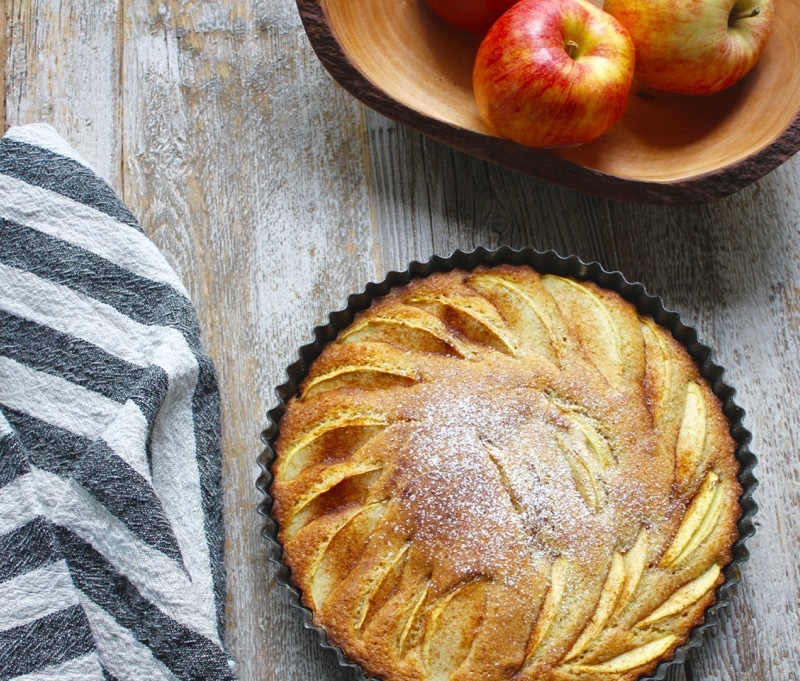 What a great way to remember your trip with this delicious looking apple cake! Smiles Susan. I read the Hobbit and the Lord of the Rings in college. Wrote a paper for one of my classes. Still get the shivers over Gollum. The pictures are beautiful, Aunt Penny…and you’re Norwegian Apple cake looks scrumptious! Wish we knew more about this heritage as well. Grandma’s Apple Cake was/is still my favorite….will love to make your recipe. I love Grandma’s apple cake too Jennie. I think I posted about it a few years ago. Will have to check my archives. Sending love your way. This post was published by Penny on October 11, 2018.